BASF Construction Chemicals convened a panel discussion last month at Beachwood, Ohio, headquarters to shed light on the experiments. Panelists were BASF Admixture Systems Product Manager Mark Bury and Penn State University’s Dr. Aleksandra Radlińska who, along with National Aeronautics and Space Administration’s Dr. Richard Grugel, designed experiment protocols and two packages of construction materials that were launched into space this past May. BASF Technology Manager Paul Horst Seiler moderated the program. NASA-funded research—officially named Microgravity Investigation of Cement Solidification (MICS)—will enable scientists to analyze the hydration reaction and microstructure formation in cement pastes that solidify in a microgravity environment. The MICS investigation supports the evaluation of microstructure and material properties of benchmark cement samples. Different responses to thermal and mechanical loading are expected and will be characterized in detail. Positive attributes found in the hardening process due to the microgravity environment aboard the ISS will be reported with the intent of improving Earth-based cement and concrete processing. More than 120 samples mixed in space have now returned to Earth and are in the process of being evaluated and analyzed by Juliana Neves, the Penn State graduate student leading the project. Results will be available in the near future. Additional experiments are also being developed for future space flights. “Evaluation of the samples and applying the findings are the first steps toward making and using concrete on extraterrestrial bodies,” Radlińska affirmed. 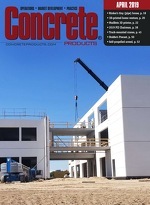 Mark Kuhar is Editor of Rock Products, a Semco Publishing sister title of Concrete Products.